MACAO – April 15, 2016 – With Mother’s Day just around the corner, spoil the most important woman in your life with special treats on offer at Conrad Macao, Cotai Central. From indulgent buffets at Grand Orbit restaurant, to traditional Chinese feasts at Conrad Macao’s signature restaurant, Dynasty 8, the Mother’s Day special menus are available from 7-8 May. What better way to thank her than with a pampering head to toe indulgent spa retreat at Bodhi Spa, available all month long from May 1 to 31, 2016. The whole family will appreciate the impressive selection of indulgent delights on offer at Grand Orbit’s buffet. The international buffet features Canadian snow crab, roasted prime beef rib for the lunch buffet and Boston lobster, Australian rack of lamb, Italian style roasted boneless suckling pig “Porchetta”, Baked oysters Kilpatrick with spinach, and a sumptuous sashimi station for the dinner buffet. Mums with a sweet tooth will enjoy the wide array of desserts, pastries, decadent cakes and the magnificent chocolate fountain. With so much choice on offer you will find something to treat everyone. Mum’s dining experience will be taken to a whole new level with a selection of gourmet set menus on offer at Conrad Macao’s signature restaurant Dynasty 8. Highlights of some of the menus include double-boiled superior soup with fish maw, silk chicken and matsutake mushrooms; wok-fried prawns and scallops with chili sauce; braised chicken, sliced abalone in abalone sauce; and braised vegetables with fresh crab meat. To make mum feel really special book a pampering Champagne and Rose Retreat for her at Bodhi Spa, located on Level 3, Conrad Macao. The treatment starts with 30-min private use of the Spa suite including aromatic Spa bath with a glass of rose Champagne, followed by a 90 mins Rose Indulgence Facial and 60- min Aromatic Rose Massage that will leave her feeling totally relaxed. To enhance the overall experience, Bodhi Spa has also added a complimentary gift of a Full-Sized Aromatherapy Associates Rose Hand Cream for mum. Gift vouchers are also available to purchase. To keep up with the latest happenings at Conrad Macao during Mother’s Day, please visit Conrad Macao Cotai Central or follow us at facebook.com/conradmacao and instagram.com/conradmacao. Guests can also follow Conrad’s inspired journeys via the brand’s Conrad Concierge mobile app and at StayInspired.com. + Subject to 10% service charge and 5% government tax. Terms and Conditions apply. Photo caption: Spoil Mum this Mother’s Day with pampering spa retreats and indulgent buffets at Conrad Macao, Cotai Central. Conrad Hotels & Resorts is the destination for the new generation of smart luxury travelers for whom life, business and pleasure seamlessly intersect. Conrad offers its guests an innovative way to Stay Inspired through a curated collections of 1/ 3/ or 5 hour experiences, available through www.StayInspired.com or through the intuitive Conrad Concierge mobile app. Consisting of 23 properties across five continents, Conrad is part of Hilton Worldwide, a leading global hospitality company. Connect with Conrad by booking at www.conradhotels.com. Learn more about the brand by visiting news.conradhotels.com or following us on Facebook, Instagram and Twitter (@conradhotels). Hilton Worldwide (NYSE: HLT) is a leading global hospitality company, comprised of more than 4,600 managed, franchised, owned and leased hotels and timeshare properties with more than 758,000 rooms in 100 countries and territories. For 96 years, Hilton Worldwide has been dedicated to continuing its tradition of providing exceptional guest experiences. The company's portfolio of 13 world-class global brands includes Hilton Hotels & Resorts, Waldorf Astoria Hotels & Resorts, Conrad Hotels & Resorts, Canopy by Hilton, Curio - A Collection by Hilton, DoubleTree by Hilton, Embassy Suites by Hilton, Hilton Garden Inn, Hampton by Hilton, Tru by Hilton, Homewood Suites by Hilton, Home2 Suites by Hilton and Hilton Grand Vacations. 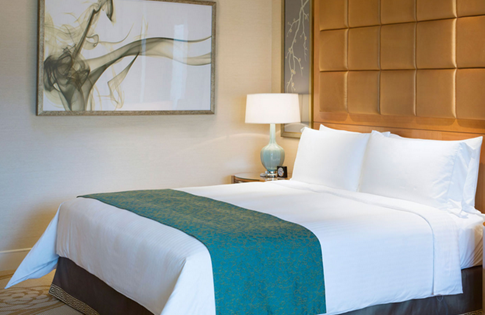 The company also manages an award-winning customer loyalty program, Hilton HHonors®.